Base your answers to the questions below on the map and your knowledge of social studies. 1. According to legend, Cleopatra committed suicide by drowning herself in the Ionian Sea. 2. For the Battle of Actium, the land forces of Octavius (Octavian, later Augustus) were located immediately north of what city? 3. Octavian defeated the forces of Cleopatra and Mark Antony at the Battle of Actium in 31 BCE. 4. 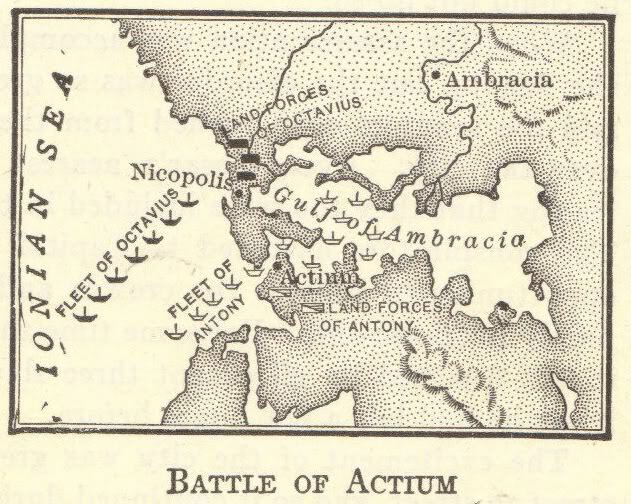 For the Battle of Actium, Mark Antony's land forces were located immediately south of what city? 5. According to the map, Mark Antony's fleet was located in the Gulf of Ambracia and the Ionian Sea.